325 Commonwealth is located on the north side of Commonwealth, between Hereford and Massachusetts Avenue, with 323 Commonwealth to the east and 327 Commonwealth to the west. 325 Commonwealth was designed by architect George F. Meacham and built in 1879-1880 by James W. Tobey, builder, as the home of Frank N. Thayer and his wife, Ella S. (Young) Thayer. He is shown as the owner of 325 Commonwealth on the original building permit application, dated April 28, 1879, and on the final building inspection report, dated November 1, 1880. Ella Thayer purchased the land for 325 Commonwealth on February 1, 1879, from Grenville T. W. Braman, Henry D. Hyde, and Henry M. Whitney, trustees of a real estate investment trust that had purchased several parcels of land on March 1, 1872, from the Boston Water Power Company. 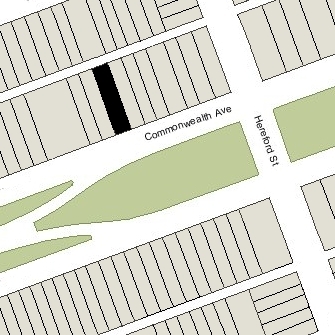 Click here for an index to the deeds for 325 Commonwealth, and click here for further information on the land on the north side of Commonwealth between Hereford and Massachusetts Avenue. By the 1880-1881 winter season, Frank and Ella Thayer had made 325 Commonwealth their home. They previously had lived at 547 Columbus. He was a ship’s chandler, ship broker, and shipping merchant. Frank Thayer died in April of 1882. Ella Thayer continued to live at 325 Commonwealth during the 1883-1884 winter season, but moved thereafter. On September 30, 1884, 325 Commonwealth was purchased from Ella Thayer by retired marble merchant, John Cowdin. He was a widower and previously had lived at 36 Staniford, where his wife, Elizabeth P. (McIntyre) Cowdin, had died in July of 1873. John Cowdin died in March of 1885. He had no children and, after various bequests, left the residue of his estate, including 325 Commonwealth, to his nephews, John Elliot Cowdin and Winthrop Cowdin, both of New York City, the sons of his deceased brother, Elliot C. Cowdin. On June 10, 1885, 325 Commonwealth was purchased from John Elliot Cowdin and Winthrop Cowdin by Susan Tillinghast (Morton) Kimball, the widow of merchant and banker Moses Day Kimball. Their unmarried children — Susan Day Kimball, Hannah Parker Kimball, Marcus Morton Kimball, and Moses Day Kimball, Jr. — lived with her. They previously had lived at 65 Mt. Vernon. On September 24, 1885, she transferred the property to herself and Samuel S. Shaw as trustees under the will of her deceased husband. Marcus Kimball married on April of 1892 to Jeanie Lawrence Perkins. 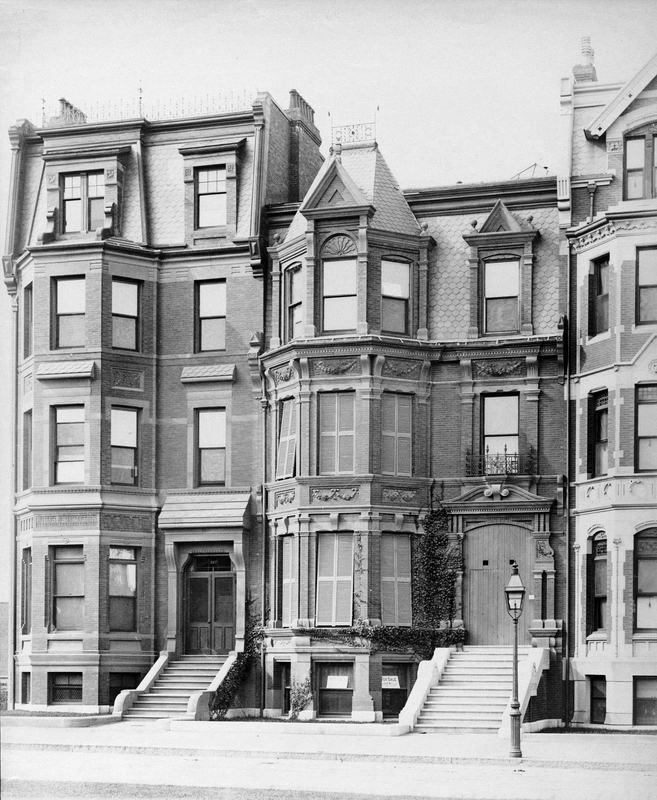 After their marriage, they lived at 325 Commonwealth during the 1892-1893 winter season and then moved to 343 Beacon. An attorney by training, he was in the electrical lighting business until about 1898, when he began to practice law. Moses Day Kimball, Jr., graduated from Harvard Law School in 1892. He died in March of 1893 in Washington DC while serving as private secretary to US Supreme Court Justice Horace Gray. Susan Kimball died in March of 1900. 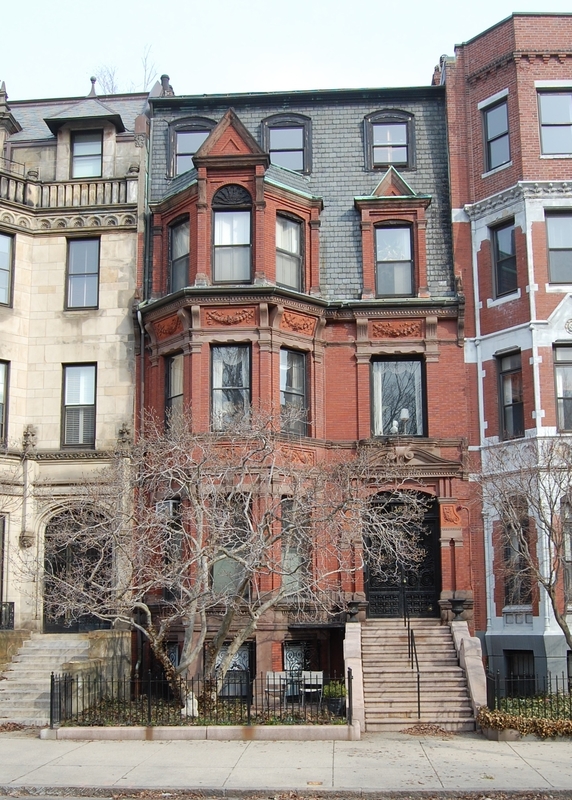 Her daughters, Susan Day Kimball and Hannah Parker Kimball, a poet, continued to live at 325 Commonwealth in 1901, but by 1903 had moved to 317 Beacon to live with their brother-in-law and sister, William and Mary (Kimball) Kehew. On May 31, 1901, 325 Commonwealth was purchased from the Kimball family by Eugene Tompkins. He previously had lived at The Kensington (northeast corner of Boylston and Exeter). In his appendix to Houses of Boston’s Back Bay, Bainbridge Bunting indicates that the façade of 325 Commonwealth was remodeled ca. 1900 (he is uncertain as to the date), and attributes the design to William G. Preston. Eugene Tompkins was a theatrical manager, producer of stage plays and musical comedies, and owner and manager of the Boston Theatre, which his father had bought from Edwin Booth. He had retired in 1901, probably about the same time he purchased 325 Commonwealth. He was a widower. In June of 1906, he married again, to Alice Maude (Huguley) Pervere, the widow of Asa Everett Pervere. They lived at 325 Commonwealth after their marriage. Eugene Tompkins died in February of 1909. In his will, he left the residue of his estate, including 325 Commonwealth, in trust for the benefit of his wife. Alice Tompkins continued to live at 325 Commonwealth and, in January of 1912, married again, to Ernest Grant Howes, a leather merchant. They lived at 325 Commonwealth after their marriage. In April of 1916, Alice Howes applied for (and subsequently received) permission to raise the roof in the front of the house, eliminate the mansard to provide headroom to create two new rooms with two new windows. The remodeling was designed and constructed by the George A. Fuller Company, a building contracting firm with offices in New York, Chicago, Boston, and other cities. Ernest and Alice Howes continued to live at 325 Commonwealth until the mid-1930s, after which they made Cohasset their home. They also maintained a home in Palm Beach, Florida. In 1935 and 1936, it was the home of Alice Howes’s son by her first marriage, Everett Whitfield Pervere, and his wife, Nanine Woodward (Pond) Greene Pervere. He was a leather merchant. They subsequently made their home in North Andover. On September 4, 1936, 325 Commonwealth was acquired from the trustees under Eugene Tompkins’s will by Aaron Eck. He was assistant treasurer and office manager of Ernest Howes’s leather firm. Aaron Eck and his wife, Edith (Stokes) Eck, lived in Braintree. 325 Commonwealth was shown as vacant in the 1937 and 1938 City Directories. On July 21, 1938, 325 Commonwealth was purchased from Aaron Eck by Miss Rose Ruvin. Living with her were her sisters, Eda Ruvin, a nurse, and Pauline Ruvin, a secretary in a dispensary. They all previously had lived at 521 Beacon, where Rose Ruvin had operated the Kenmore Dormitory. They had come to America in 1906-1907 with their mother, Gertrude (Gittel) (Garshfield/Herschschild) Orzefsky (Orzewsky), widow of Reuben Orzewsky; they began using the name Ruvin in about 1913. In September of 1938, Rose Ruvin applied for (and subsequently received) permission to convert 325 Commonwealth from a single-family dwelling into a lodging house, which she subsequently operated as the Kenmore Dormitory. She and her sisters continued to live and operate the dormitory there until about 1946. On April 1, 1946, 325 Commonwealth was purchased from Rose Ruvin by William Mills Dawes, an accountant, and his wife, Grace S. (Baxter) Frederick Dawes, who operated it as a lodging house. They previously had lived at 211 Beacon, which they had converted into a lodging house and continued to own. On March 5, 1947, they transferred the property into Grace Dawes’s name as trustee of the Baxter Trust. They continued to live at 325 Commonwealth until about 1956. On September 14, 1956, 325 Commonwealth was acquired from Grace Dawes by Anna M. (Phippared) McLean (MacLean), the widow of Hallett Ray McLean. She previously had lived at 278 Commonwealth. She continued to live at 325 Commonwealth until about 1958. By about 1960, she was living in Milford, New Hampshire. On August 22, 1958, 325 Commonwealth was acquired from Anna M. McLean (MacLean) by The Dormitory Corporation (Robert Share, president). 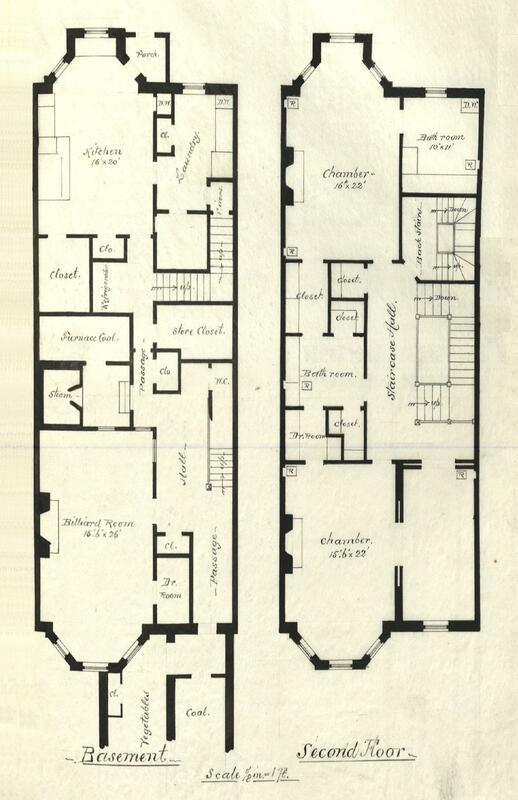 That same month, The Dormitory Corporation filed for (and subsequently received) permission to convert 325 Commonwealth from a lodging house into a dormitory. It subsequently became a dormitory for the Berklee College of Music. It continued to be a Berklee dormitory. In April of 1962, he filed for (and subsequently received) permission to convert the property back into a dormitory, to be used by Burdett College. On May 7, 1962, 325 Commonwealth was acquired from Robert Tillinghast by First Community Investment Co., Inc., of Lexington. On July 3, 1962, First Community Investment transferred 325 Commonwealth to Robert J. McHugh, trustee of the Mifro Realty Trust, and on August 13, 1965, he transferred the property back to First Community Investment. 325 Commonwealth remained a Burdett College dormitory until about 1966. On June 13, 1966, 325 Commonwealth was acquired from First Community Investment by Chamberlayne School and Chamberlayne Junior College, located at 128 Commonwealth. It operated 325 Commonwealth as a dormitory for its students. In the mid-1970s, Chamberlayne went bankrupt and on May 28, 1975, it transferred 325 Commonwealth to the Home Owners Federal Savings and Loan Association. On January 22, 1976, 325 Commonwealth was purchased from Home Owners Federal Savings and Loan by Allan W. McLeod, trustee of the 325 Commonwealth Avenue Trust. 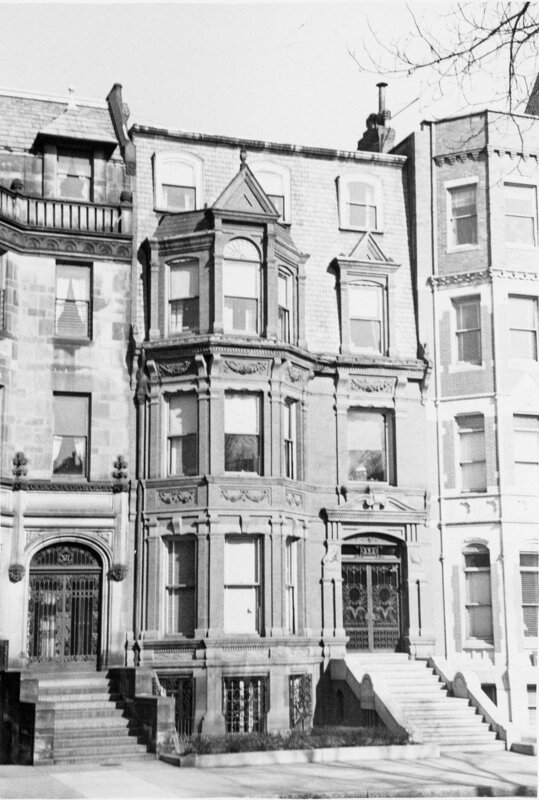 In February of 1976, the trust applied for (and subsequently received) permission to convert the property from a dormitory into seven apartments. 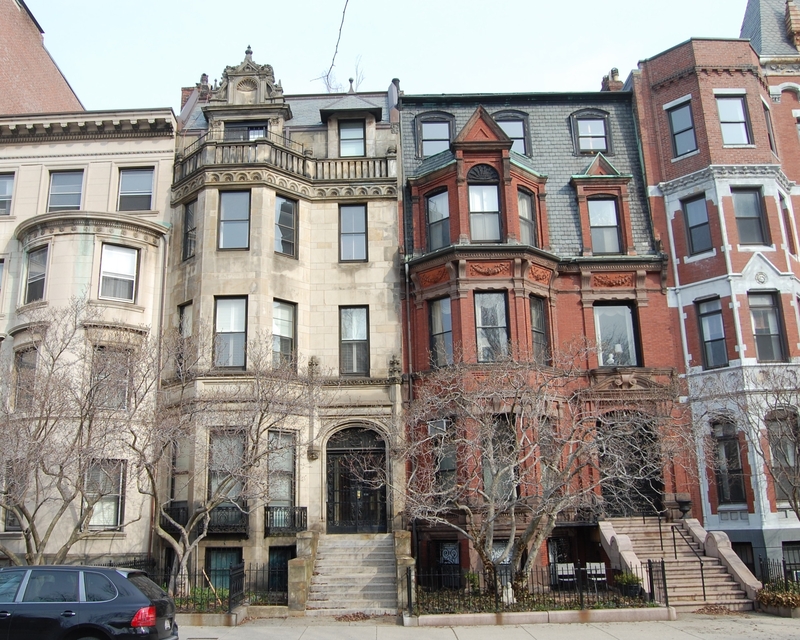 On April 14, 1978, 325 Commonwealth was purchased from Jules Vacadi, successor trustee of the 325 Commonwealth Avenue Trust, by Kevin O’Reilly, trustee of The Jaime Realty Trust. On November 16, 1978, Kevin O’Reilly converted the property into seven condominium units, the 325 Commonwealth Condominium.